Having visited the pottery factories in Poland has given me a true appreciation for their products. It was fascinating to see each artist bent over their work, hand painting or stamping their pieces with intense concentration. Each piece is signed by the artist as well as stamped with the Polish word for “unique.” It is true that each piece is unique. But all the pottery went through the same process of being fired in the kiln. Today’s verse recognizes that each believer faces the same kinds of trials and tests. The details may vary. The timing and even the intensity may differ. But there is a commonality to all of the trials God allows us to face. They are never intended to weaken us but to strengthen our faith. In each trial we see God’s hand and His faithfulness. And we have His promise that it will never be more than we can bear. What I am facing is never unique. Somewhere, someone in the world has faced nearly the same thing. Knowing that helps me to not feel so alone. Not only can I draw strength from the stories of others, but I can be encouraged knowing what Christ faced. He experienced every kind of temptation and yet did not sin. (Heb. 4:15) And because He Himself suffered when tempted, He is there to help (Heb. 2:18) He Himself is my “way out.” Depending on His strength and help makes all the difference. Thank you Lord, that I do not need to do this alone. Categories: Faith and Trust, Faithfulness, God's Strength and Power, Pottery series, Suffering and Trials | Permalink. All is not lost with a cracked bowl. The hairline crack on this one was deftly hidden by the painted design incorporating it. An honest pottery merchant would label this piece as a “second” or “third” because of the defect. An unscrupulous pottery merchant might fill in the crack with wax, paint over it and try to pass it off as perfect. The customer would be none the wiser, at least at first. Eventually, the defect would be apparent. Today’s verse is a great example of coming clean with the Lord. King David recognized that some of his physical ailments could be attributed to keeping silent about his sin (verses 3-4). When he acknowledged and confessed his wrongdoing he experienced God’s forgiveness, not only for his sin but also for his sense of guilt. David understood that by having a deceitful spirit with God one would be forfeiting His blessing (verse 2). He ends this psalm in joy and singing having reestablished his relationship with God. When I am not honest with God, I am like that cracked pottery trying to pass myself off as perfect! But the healing of those cracks can only come when I come clean with Him. What keeps me from humbling myself is my own stubborn pride. It is much easier to ignore my sin and pretend everything is fine. But before long, the cracks become apparent and my excuses no longer hold water. I know He will restore to me that joy of salvation if I own up instead of cover up! Lord, thank you for the forgiveness You so freely give! Categories: Grace and Forgiveness, Holiness, Pottery series | Permalink. These broken pieces of bisque look pretty pathetic. For whatever reason they did not survive their first firing during the process of becoming beautiful pottery. The first firing is to strengthen the clay. Their glazing, unique colors and design can only be applied after this important step. 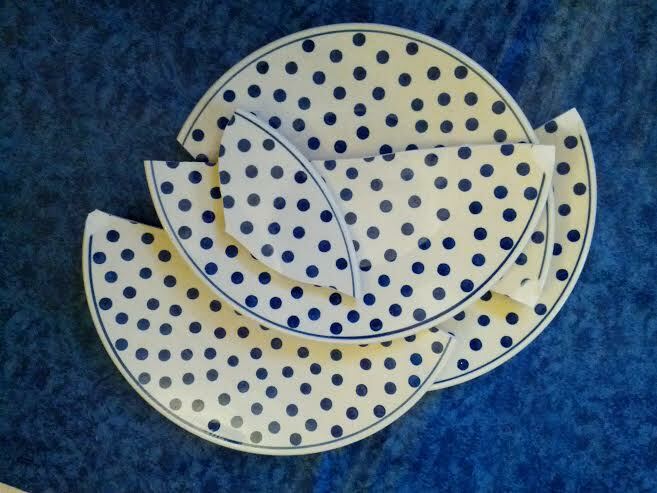 When touring a Polish pottery factory I remember seeing a huge bin full of broken bisque pieces. Our guide explained that rather than throw them out, they would melt them all down to start again. When hearing this explanation, I could not help but think of today’s verse. Paul is confident that God will continue His work in the hearts of believers. He has a goal for each of us to grow more and more like His Son. And even though the process is life-long, what He starts, He promises to finish. Just as pottery needs firing to be strengthened, so our faith is built up by the “fiery trials” we experience (I Peter 4:12). When life heats up with impossible situations or insurmountable obstacles, it becomes clear just where we are weak. With each testing of our faith, we ideally become more confident of His control and goodness. Lord, keep me trusting You, especially in the hard times. Categories: Grace and Forgiveness, Hope, Pottery series, Self Image, Suffering and Trials | Permalink. 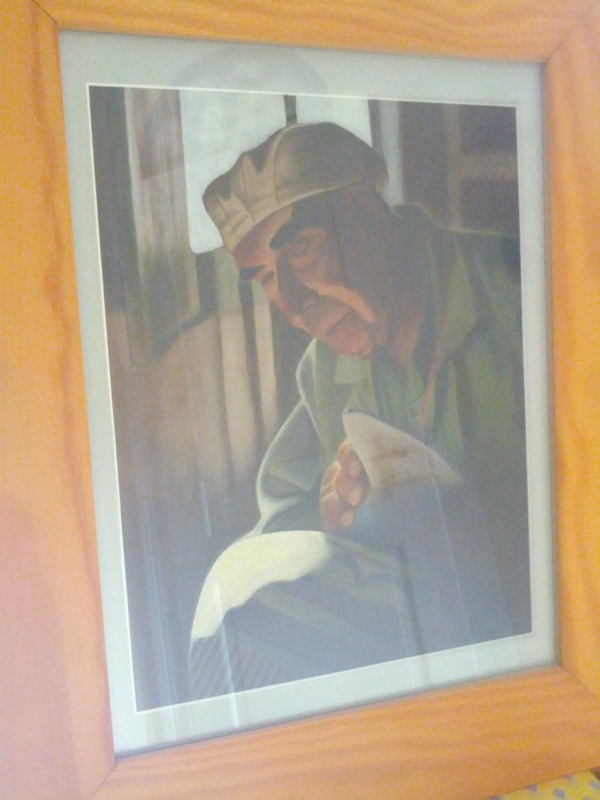 This beautiful painting of a potter fashioning a vase was done by our daughter, Rebekah, in high school. It hangs proudly in our entryway and reminds me that we are all a work in progress. The potter looks so involved and attentive to his work. He seems to be handling the vase with special care. It looks to be almost completed with just a few finishing touches. The image of God as our Potter is found throughout Scripture. We are the clay and He fashions us according to His purposes. But as with any pottery making process, pressure is needed on that clay to create. On the wheel, artistic hands press and push to form the shape wanted. The result is beautiful but the process looks arduous! In our verse for today, Paul is feeling great pressure. Troubles in his life were so difficult that he did not know if he could survive. He feared that they were beyond his ability to endure. Yet he recognized that there was a purpose behind them. Paul saw that his Potter was using the pressure to encourage him to rely on God’s strength (verse 9). I know my Potter uses some of those same methods in fashioning me into a vase He can use. He allows pressures and difficulties in my life to sculpt and teach me dependence on Him. It is not at all comfortable, but I know it is necessary. Thank you Lord, that I can trust the pressure of Your hands to make something beautiful of my life! Categories: Devotions, Pottery series | Permalink.